The cyclooxygenase 2 (COX-2) inhibitor celecoxib (also called celebrex), approved for the treatment of colon carcinogenesis, rheumatoid arthritis, and other inflammatory diseases, has been shown to induce apoptosis and inhibit angiogenesis. Because NF-κB plays a major role in regulation of apoptosis, angiogenesis, carcinogenesis, and inflammation, we postulated that celecoxib modulates NF-κB. In the present study, we investigated the effect of this drug on the activation of NF-κB by a wide variety of agents. We found that celecoxib suppressed NF-κB activation induced by various carcinogens, including TNF, phorbol ester, okadaic acid, LPS, and IL-1β. Celecoxib inhibited TNF-induced IκBα kinase activation, leading to suppression of IκBα phosphorylation and degradation. Celecoxib suppressed both inducible and constitutive NF-κB without cell type specificity. Celecoxib also suppressed p65 phosphorylation and nuclear translocation. Akt activation, which is required for TNF-induced NF-κB activation, was also suppressed by this drug. 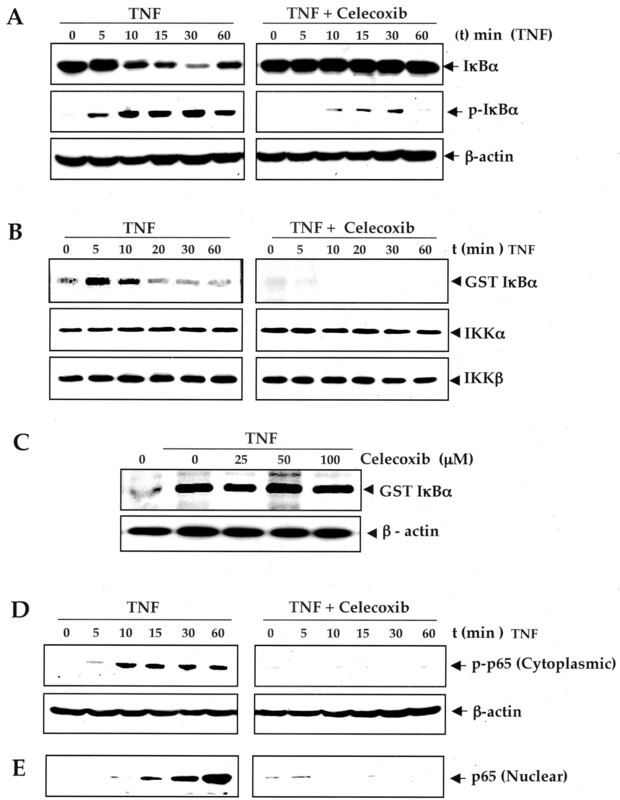 Celecoxib also inhibited the TNF-induced interaction of Akt with IκBα kinase (IKK). 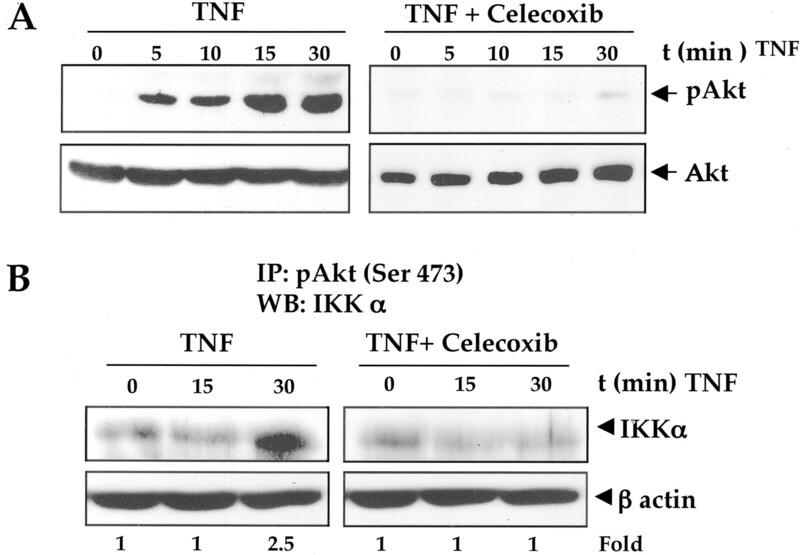 Celecoxib abrogated the NF-κB-dependent reporter gene expression activated by TNF, TNF receptor, TNF receptor-associated death domain, TNF receptor-associated factor 2, NF-κB-inducing kinase, and IKK, but not that activated by p65. The COX-2 promoter, which is regulated by NF-κB, was also inhibited by celecoxib, and this inhibition correlated with suppression of TNF-induced COX-2 expression. Besides NF-κB, celecoxib also suppressed TNF-induced JNK, p38 MAPK, and ERK activation. Thus, overall, our results indicate that celecoxib inhibits NF-κB activation through inhibition of IKK and Akt activation, leading to down-regulation of synthesis of COX-2 and other genes needed for inflammation, proliferation, and carcinogenesis. Celecoxib (1,5-diaryl pyrazole-based compound), a specific cyclooxygenase (COX)-23 inhibitor, has recently been approved for the treatment of rheumatoid arthritis and osteoarthritis (1). This nonsteroidal anti-inflammatory agent has also been shown to reduce the formation of polyps in familial adenomatous polyposis patients (2). In vivo, celecoxib has been shown to suppress the growth of colon and head and neck cancers (3, 4) and enhance the antitumor activity of chemotherapeutic agents (5). Numerous studies suggest that this drug exhibits chemopreventive activity against colon cancer (6, 7, 8, 9), breast cancer (10, 11), urinary bladder cancer (12), and skin cancer (13). Celecoxib has also been shown to suppress angiogenesis (14), most likely through reduction in proliferation and induction of apoptosis in endothelial cells (15). There is also a report indicating that celecoxib reduces pulmonary inflammation (16). In vitro, celecoxib has been shown to induce apoptosis of colon cancer cells (17), pancreatic cancer cells (18), and prostate cancer cells (19). Whether antitumor, chemopreventive, antiangiogenic, anti-inflammatory, or apoptotic, effects of celecoxib are mediated exclusively through the inhibition of COX-2 are not fully understood (20). Indeed, it has been shown that celecoxib exhibits the greatest potency for growth inhibition in COX-2-negative hemopoietic and epithelial cell lines (21). Similarly, celecoxib was found to induce cell cycle arrest and apoptosis in colon cancer cells in a COX-2-independent manner (22). These reports suggest that there are other mechanisms through which celecoxib could mediate its effects. Recently, it was shown that celecoxib could induce apoptosis through suppression of Akt activation (17, 19) and through perturbation of intracellular calcium by inhibiting endoplasmic reticulum Ca2+ ATPases (23). Because suppression of NF-κB activation has been linked with antitumor, chemopreventive, chemosensitivity, suppression of inflammation, antiangiogenesis, and apoptosis, we postulated that celecoxib mediates its effects at least partly through suppression of NF-κB activation. NF-κB has been shown to regulate the expression of a number of genes whose products are involved in tumorigenesis (24, 25). These include antiapoptotic genes (e.g., cellular inhibitor of apoptosis, survivin, TNF receptor-associated factor (TRAF), bcl-2, and Bcl-xL); COX-2; matrix metalloproteinase-9; genes encoding adhesion molecules, chemokines, inflammatory cytokines, and inducible NO synthase; and cell cycle regulatory genes (e.g., cyclin D1) (26). In an inactive state, NF-κB is present in the cytoplasm as a heterotrimer consisting of p50, p65, and IκBα subunits. In response to an activation signal, the IκBα subunit is phosphorylated, ubiquitinated, and degraded through the proteosomal pathway, thus exposing the nuclear localization signals on the p50-p65 heterodimer. The p65 is then phosphorylated, leading to nuclear translocation and binding to a specific sequence in DNA, which in turn results in gene transcription. An IκBα kinase, IKK, has been identified that phosphorylates serine residues in IκBα at positions 32 and 36 (27). Treatment of cells with various inflammatory and oxidative stress stimuli activates the IKK, thus leading to the degradation of IκBα and activation of the transcription factor. The activation of Akt has been implicated in NF-κB activation induced by TNF (28) and platelet-derived growth factor (29). Akt transiently associates in vivo with IKK (29) and induces IKK activation through IKKα phosphorylation at threonine 23 (28). Akt has also been shown to regulate cell survival through activation of NF-κB-mediated Bcl-xL expression (30). Akt can also suppress apoptosis by stimulating the transactivation potential of the RelA/p65 subunit of NF-κB (31). We, therefore, examined whether celecoxib can inhibit NF-κB activation induced by various carcinogens and inflammatory stimuli, and, if so, by what mechanism. The results indicate that celecoxib can suppress NF-κB activation induced by a variety of agents through inhibition of IKK and Akt. We also demonstrate the suppression of NF-κB-regulated gene expression including COX-2 itself by celecoxib. Celecoxib, purchased from LKT Laboratories (Minneapolis, MN), was dissolved in DMSO as a 100 mM stock solution and stored at −20°C. Bacteria-derived human TNF, purified to homogeneity with a sp. act. of 5 × 107 U/mg, was kindly provided by Genentech (South San Francisco, CA). Penicillin, streptomycin, RPMI 1640 medium, FBS, and lipofectamine 2000 were obtained from Invitrogen Life Technologies (Grand Island, NY). Tris, glycine, NaCl, SDS, and BSA were obtained from Sigma-Aldrich (St. Louis, MO). The following polyclonal Abs were obtained from Santa Cruz Biotechnology (Santa Cruz, CA): anti-p65, against the epitope corresponding to amino acids mapping within the amino-terminal domain of human NF-κB p65; anti-p50, against a peptide 15 aa long mapping at the nuclear localization sequence region of NF-κB p50; anti-IκBα, against aa 297–317 mapping at the C terminus of IκBα/MAD-3; and anti-c-Rel, p38 MAPK, ERK, JNK, and anti-cyclin D1 against aa 1–295, which represent full-length cyclin D1 of human origin. Phospho-IκBα (Ser32) Ab was purchased from New England Biolabs (Beverly, MA). Anti-IKKα and anti-IKKβ Abs were kindly provided by Imgenex (San Diego, CA). Anti-Akt, phospho-Akt, phospho-p38 MAPK, and pERK Abs were purchased from Cell Signaling Technology (Beverly, MA). The cDNA plasmid for dominant-negative mutant of Akt was kindly provided by J. Woodgett (Ontario Cancer Institute, Toronto, Canada). Anti COX-2 Ab was purchased from Invitrogen Life Technologies, and anti-matrix metalloproteinase-9 (MMP-9) Ab was purchased from Cell Sciences (Norwood, MA). Deletion mutants of IκBα encoding aa 37–317 (IκBαΔN) were kindly provided by D. Ballard (Vanderbilt University School of Medicine, Nashville, TN) and used as indicated (32, 33). The 16,16-dimethyl PGE2 was purchased from Cayman Chemical (Ann Arbor, MI). Human non-small cell lung carcinoma (H1299), human lung epithelial cell carcinoma (A549), and immortalized human bronchial epithelial cells (BEAS-2B) were kindly provided by R. Lotan (University of Texas M.D. Anderson Cancer Center). Human embryonic kidney cells (293) and human multiple myeloma cell lines U266 and RPMI 8226 were obtained from American Type Culture Collection (Manassas, VA). H1299, A549, U266, and RPMI 8226 cells were cultured in RPMI 1640 medium, and 293 cells were cultured in MEM, both supplemented with 10% FBS, 100 U/ml penicillin, and 100 μg/ml streptomycin. BEAS-2B cells were cultured in keratinocyte serum-free medium. Human head and neck squamous cell carcinoma cell lines MDA 1986 (cervical nodal metastasis of tongue cancer) and Tu 167 (floor of mouth squamous cell carcinoma line) were obtained from G. Clayman (University of Texas M.D. Anderson Cancer Center) and were cultured in DMEM containing 10% FBS, nonessential amino acids, pyruvate, glutamine (1%), and vitamins (2%). To determine NF-κB activation, we conducted EMSA essentially as previously described (34). Briefly, nuclear extracts prepared from cells (2 × 106/ml) treated with carcinogens were incubated with 32P-end-labeled 45-mer double-stranded NF-κB oligonucleotide (4 μg of protein with 16 fmol of DNA) from the HIV long terminal repeat, 5′-TTGTTACAAGGGACTTTCCGCTGGGGACTTTCCAGGGAGGCGTGG-3′ (boldface indicates NF-κB binding sites), for 15 min at 37°C, and the DNA-protein complex formed was separated from free oligonucleotide on 6.6% native polyacrylamide gels. A double-stranded mutated oligonucleotide, 5′-TTGTTACAACTCACTTTCCGCTGCTCACTT-TCCAGGGAGGCGTGG-3′, was used to examine the specificity of binding of NF-κB to the DNA. The specificity of binding was also examined by competition with the unlabeled oligonucleotide. For supershift assays, nuclear extracts prepared from TNF-treated cells were incubated with Abs against either p50 or p65 of NF-κB for 30 min at room temperature before the complex was analyzed by EMSA. Abs against cyclin D1 and preimmune serum were included as negative controls. The dried gels were visualized, and radioactive bands were quantitated using a PhosphorImager (Molecular Dynamics, Sunnyvale, CA) using Imagequant software. 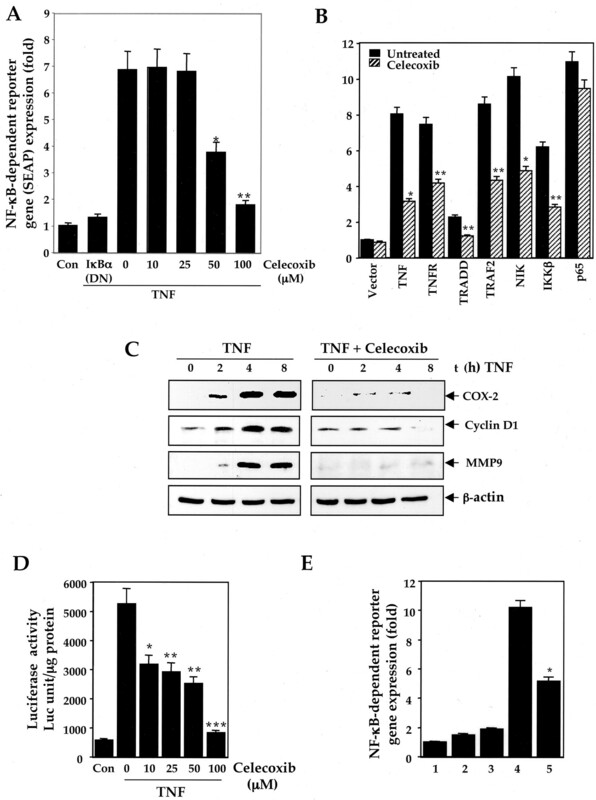 To determine the effect of celecoxib on TNF-dependent IκBα degradation, cytoplasmic extracts were prepared, as previously described (35), from H1299 cells (2 × 106/ml) pretreated with celecoxib for 4 h and then exposed to 0.1 nM TNF for various times. The extracts were then resolved on 10% SDS-polyacrylamide gels. After electrophoresis, the proteins were electrotransferred to nitrocellulose filters, probed with rabbit polyclonal Abs against IκBα, and detected by chemiluminescence (ECL; Amersham Pharmacia Biotech, Piscataway, NJ). The bands obtained were quantitated using Personal Densitometer Scan v1.30 using Imagequant software version 3.3 (Molecular Dynamics). To determine the effect of celecoxib on TNF-dependent IκBα phosphorylation, cytoplasmic extracts were prepared from H1299 cells (2 × 106 cells/ml), pretreated with a proteosome inhibitor (acetyl-leucyl-leucyl-norleucinal, 100 μM) for 1 h, then exposed to 100 μM celecoxib for 4 h before treating with 0.1 nM TNF for various times. The extracts were then resolved on 10% SDS-polyacrylamide gels and analyzed by Western blotting using Ab against phosphorylated IκBα, as described previously (35). To determine the effect of celecoxib on TNF-induced IKK activation, we assayed IKK by a method essentially as described previously (36). Briefly, IKK complex was precipitated from whole cell extracts with Ab to IKKα and IKKβ, assayed by kinase assay using GST-IκBα (1–54) as a substrate, and resolved on 10% polyacrylamide gel. The radioactive bands were then visualized using a PhosphorImager. To determine the total amounts of IKKα and IKKβ in each sample, 30 μg of the whole cell extract protein was resolved on a 10% acrylamide gel and analyzed by Western blotting using Ab against IKKα and IKKβ, as described previously. To determine the effect of celecoxib on TNF-induced JNK activation, we assayed JNK by a method essentially as described previously (36). Briefly, JNK was precipitated from whole cell extracts with Ab to JNK, assayed in kinase assay using GST-cJun (1–79) as a substrate (2 μg/sample), and resolved on 10% polyacrylamide gel. The radioactive bands were then visualized using a PhosphorImager. To determine the total amounts of JNK in each sample, 30 μg of the whole cell extract protein was resolved on a 10% acrylamide gel and analyzed by Western blotting using Ab against JNK, as described previously. The effect of celecoxib on TNF-induced NF-κB-dependent reporter gene transcription was measured, as previously described (37). Briefly, H1299 cells (5 × 105 cells/well) were plated in six-well plates and transiently transfected the next day by lipofectamine 2000 method with pNF-κB secretory alkaline phosphatase (SEAP) and other plasmids, as indicated in the results using manufacturer’s protocol. To examine the effect of celecoxib on TNF-induced reporter gene expression, we transfected the cells with the SEAP expression plasmid (2 μg) for 18 h. Thereafter, we changed the medium and treated the cells with various doses of celecoxib for 4 h and then exposed to TNF for 24 h. To examine the specificity of TNF-induced NF-κB-dependent SEAP expression, cells were transfected with dominant-negative IκBα plasmids along with pNF-κB SEAP and then treated with 1 nM TNF. The cell culture medium was then harvested and analyzed for alkaline phosphatase (SEAP) activity essentially according to the protocol described by the manufacturer (BD Clontech, Palo Alto, CA) using a 96-well fluorescence plate reader (Fluoroscan II; Labsystems, Chicago, IL) with excitation set at 360 nm and emission set at 460 nm. Thirty to sixty micrograms of whole cell protein was resolved on 10% SDS-PAGE gel, transferred to a nitrocellulose membrane, blocked with 5% nonfat milk, and probed with specific Abs against IκBα (1/3000), phospho-IκBα (1/1000), cyclin D1, MMP-9, and COX-2 (1/1000) separately. The blots were washed, exposed to HRP-conjugated secondary Abs for 1 h, and finally detected by ECL reagent (Amersham Pharmacia Biotech). For COX-2 and MMP-9 assays, whole cell extracts were prepared from treated cells (2 × 106 cells in 2 ml of medium) and resolved on 7.5% SDS-polyacrylamide gels. Cells were washed with ice-cold PBS and lysed in a buffer containing 50 mM HEPES, pH 7.5, 1.5 mM MgCl2, 150 mM NaCl, 1 mM EGTA, 20 mM NaF, 10 mM Na4P2O7 (sodium pyrophosphate), 10% glycerol, 1% Triton X-100, 3 mM benzamidine, 1 mM Na3VO4 (sodium orthovanadate), 1 M pepstatin, 10 μg/ml aprotinin, 5 mM iodoacetic acid, and 2 μg/ml leupeptin to prepare whole cell lysate. Lysates were clarified by centrifugation at 14,000 × g for 10 min. Whole cell lysates were incubated for 1 h with Abs against phospho-Akt (serine 473). Immune complexes were precipitated with 50% slurry of protein A-Sepharose beads (Pierce, Rockford, IL), washed, and eluted by boiling in SDS sample buffer. Eluted proteins were then resolved by SDS-PAGE and probed by Western blot using anti-IKKα Abs. Proteins were visualized by ECL (Amersham Pharmacia Biotech). H1299 cells were seeded at a concentration of 1.5 × 105 cells/well in six-well plates. After overnight culture, the cells in each well were transfected with 2 μg of DNA consisting of cox-2 promoter-luciferase reporter plasmid, along with 6 μl of lipofectamine 2000 (Invitrogen Life Technologies) by following the manufacturer’s protocol. The COX-2 promoter (−375 to +59) amplified from human genomic DNA by using the primers 5′-GAGTCTCTTATTTATTTTT-3′ (sense) and 5′-GCTGCTGAGGAGTTCCTGGACGTGC-3′ (antisense) was kindly provided by X.-C. Xu (University of Texas M.D. Anderson Cancer Center). After a 6-h exposure to the transfection mixture, the cells were incubated in medium containing celecoxib (100 μM) for 4 h. The cells were then exposed to TNF (0.1 nM) for 36 h and then harvested. Luciferase activity was measured by using the Promega (Madison, WI) luciferase assay system according to the manufacturer’s protocol and detected by using Monolight 2010 (Analytical Luminescence Laboratory, San Diego, CA). All experiments were performed in triplicates and repeated at least twice. In the present study, the effect of celecoxib on induction of NF-κB in non-small cell lung adenocarcinoma activated with various carcinogens and inflammatory stimuli, including phorbol ester, okadaic acid, LPS, IL-1β, and TNF, was examined. TNF was used for most of the studies to examine the effect of celecoxib on TNF-induced NF-κB activation because the pathway of NF-κB activation by this cytokine has been well characterized. The concentration of celecoxib and NF-κB activators used and the time of exposure had minimal effect on the viability of these cells as determined by trypan blue dye exclusion test (data not shown). H1299 cells were preincubated with different concentrations of celecoxib and then treated with TNF. Nuclear extracts were prepared and tested for NF-κB activation by EMSA. As shown in Fig. 1⇓A, celecoxib inhibited TNF-mediated NF-κB activation in a dose-dependent manner, with maximum inhibition occurring at 100 μM. Celecoxib by itself did not activate NF-κB. Celecoxib inhibited TNF-dependent NF-κB activation in a dose- and time-dependent manner. A, H1299 cells (2 × 106/ml) were preincubated with different concentrations of celecoxib for 4 h at 37°C and then treated with 0.1 nM TNF for 30 min. Nuclear extracts were prepared and tested for NF-κB activation, as described in Materials and Methods. B, H1299 cells (2 × 106/ml) were preincubated with 100 μM celecoxib for the indicated times at 37°C and then treated either with or without 0.1 nM TNF for 30 min at 37°C. Nuclear extracts were prepared and then tested for NF-κB activation. C, Nuclear extracts from H1299 cells (2 × 106/ml) treated or not treated with 0.1 nM TNF for 30 min were incubated with the Abs indicated for 30 min at room temperature, and the complex was analyzed by supershift assay. D, Nuclear extracts from H1299 cells (2 × 106/ml) treated or not treated with 0.1 nM TNF for 30 min were treated with the indicated concentrations of celecoxib for 2 h at room temperature and then assayed for DNA binding by EMSA. E, H1299 cells (2 × 106/ml) were preincubated for 4 h at 37°C with 100 μM celecoxib and then treated with TNF (0.1 nM), PMA (100 ng/ml), okadaic acid (500 nM), LPS (10 μg/ml), and IL-1β (100 ng/ml) for 1 h. Nuclear extracts were prepared and tested for NF-κB activation, as described in Materials and Methods. We next tested the length of incubation required for celecoxib to block TNF-induced NF-κB activation. Cells were preincubated with celecoxib for different times and then treated with TNF. The minimum time required for complete inhibition of NF-κB activation was 4 h (Fig. 1⇑B). To show that the retarded band visualized by EMSA in TNF-treated cells was indeed a complex of the p50 and p65 subunits of NF-κB, we incubated nuclear extracts from TNF-activated cells with Abs to the p50 (NF-κB1) and the p65 (RelA) subunit of NF-κB. Both Abs shifted the band to a higher molecular mass (Fig. 1⇑C), thus suggesting that the TNF-activated complex consisted of p50 and p65 subunits. Neither preimmune serum nor irrelevant Ab had any effect. Addition of excess unlabeled NF-κB (100-fold) caused complete disappearance of the band. It has been shown that the serine protease inhibitor, N-tosyl-phenylalanine chloromethyl ketone, herbimycin A, and the protein tyrosine kinase inhibitor caffeic acid phenyl ethyl ester down-regulate NF-κB activation by chemically modifying the NF-κB subunits and thus preventing NF-κB binding to DNA (38, 39, 40). 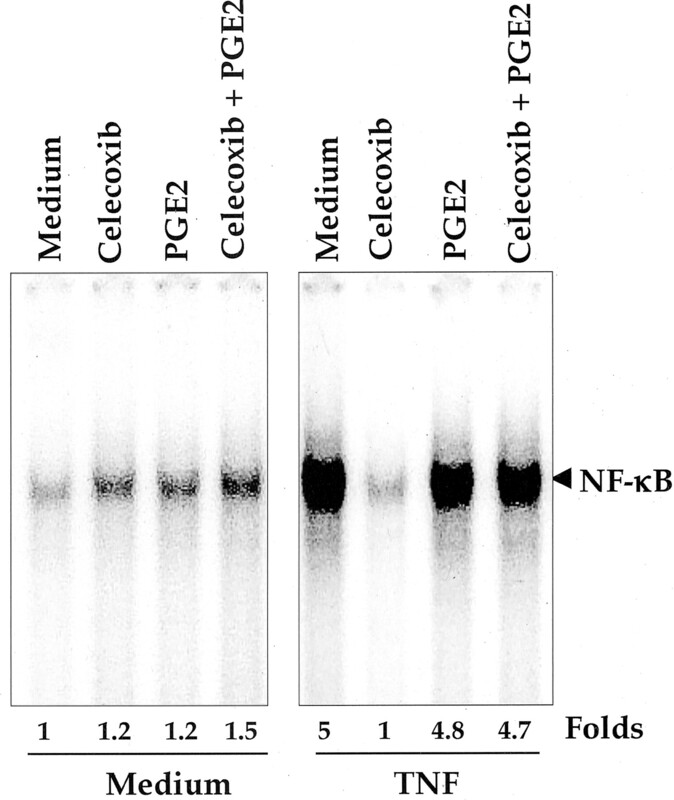 To determine whether celecoxib also suppresses NF-κB activation by directly modifying NF-κB proteins, we incubated nuclear extracts from untreated cells and those treated with TNF with various concentrations of celecoxib for 2 h at room temperature. Then DNA-binding activity was detected using EMSA. Our results (Fig. 1⇑D) show that celecoxib did not modify the DNA-binding ability of NF-κB proteins prepared by treatment with TNF. We concluded that celecoxib inhibited NF-κB activation through a mechanism different from that by which N-tosyl-phenylalanine chloromethyl ketone, herbimycin A, and caffeic acid phenethyl ester inhibit NF-κB activation. PMA, okadaic acid, LPS, and IL-1β are other potent activators of NF-κB. We, therefore, examined the effect of celecoxib on the activation of NF-κB by these agents in non-small cell lung adenocarcinoma. As shown in Fig. 1⇑E, celecoxib suppressed induction of NF-κB activation by all these agents, suggesting that celecoxib acts at a step in the NF-κB activation pathway that is common to all these agents. Whether celecoxib could inhibit TNF-induced NF-κB activation in other cell types was investigated. We examined the effect of celecoxib on immortalized human bronchial epithelial cells (BEAS-2B), lung epithelial cell carcinoma (A549), T cell leukemia (Jurkat), and myeloid leukemia (KBM-5) cells. 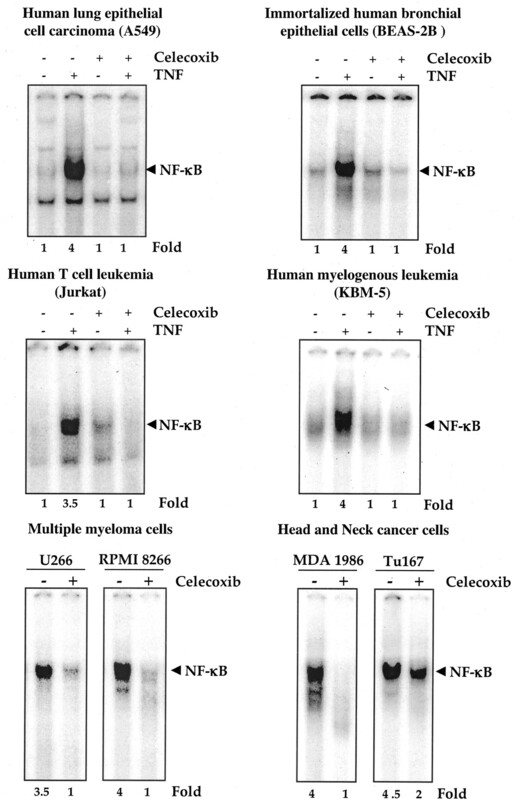 Cells were pretreated with celecoxib, then exposed to TNF and examined for NF-κB. TNF activated NF-κB in all the cell types, and celecoxib completely inhibited this activation (Fig. 2⇓), indicating a lack of cell type specificity. 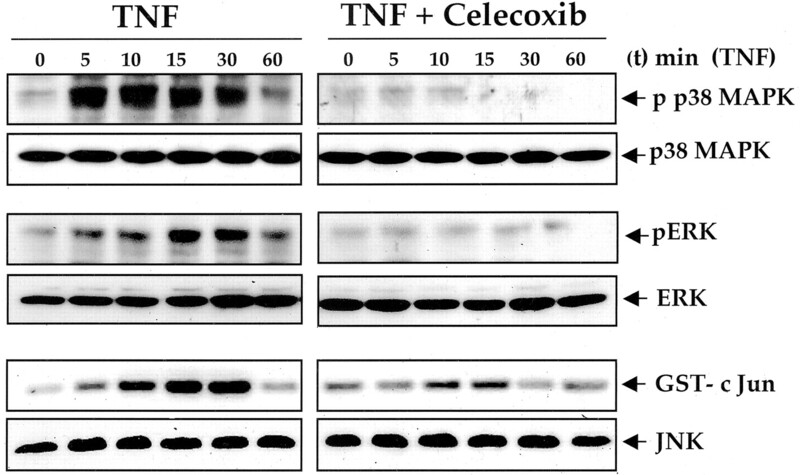 Cell type specificity of celecoxib-induced inhibition of TNF-induced NF-κB activation. Two million A549, BEAS-2B, Jurkat, KBM-5, U266, RPMI 8226, MDA1986, or Tu167 cells were pretreated with 100 μM celecoxib for 4 h and then treated with 0.1 nM TNF for 30 min. The nuclear extracts were then prepared and assayed for NF-κB by EMSA, as described in Materials and Methods. Next, we examined the effect of celecoxib on those tumor cells in which NF-κB is constitutively active. Celecoxib treatment down-regulated constitutive activation of NF-κB in multiple myeloma cell lines (U266 and RPMI 8226) and head and neck squamous cell carcinoma cell lines (MDA1986 and Tu167) (Fig. 2⇑). The translocation of NF-κB to the nucleus is preceded by the phosphorylation, ubiquitination, and proteolytic degradation of IκBα (41). To determine whether inhibition of TNF-induced NF-κB activation was due to inhibition of IκBα degradation, we pretreated cells with celecoxib and then exposed them to TNF for different times. Western blot analysis showed that TNF activated NF-κB in the control cells in a time-dependent manner, but had little effect on celecoxib-pretreated cells. TNF induced IκBα degradation in control cells as early as 10 min, but in celecoxib-pretreated cells TNF had no effect on IκBα degradation. To determine whether celecoxib affected TNF-induced IκBα phosphorylation, we examined the TNF-induced phosphorylated form of IκBα by Western blot analysis, using Ab that detects only the serine-phosphorylated form of IκBα. TNF induced IκBα phosphorylation as early as 5 min, and celecoxib almost completely suppressed the IκBα phosphorylation (Fig. 3⇓A). These results indicate that celecoxib inhibited TNF-induced phosphorylation and degradation of IκBα, and subsequent activation of NF-κB. A, Celecoxib inhibited TNF-induced degradation and phosphorylation of IκBα. H1299 cells (2 × 106/ml) were incubated with 100 μM celecoxib for 4 h at 37°C, treated with 0.1 nM TNF for different times as indicated at 37°C, and tested for IκBα (upper panel) and phosphorylated IκBα (middle panel) in cytosolic fractions by Western blot analysis. The equality of protein loading was evaluated by β-actin (lower panel). B, Celecoxib inhibited TNF-induced IκBα kinase activity. H1299 cells (2 × 106/ml) were treated with 100 μM celecoxib for 4 h and then treated with 0.1 nM TNF for different time intervals. Whole cell extracts were prepared, and 200 μg of extract was immunoprecipitated with Abs against IKKα and IKKβ. An immune complex kinase assay was then performed, as described in Materials and Methods. To examine the effect of celecoxib on the level of expression of IKK proteins, 30 μg of cytoplasmic extracts was run on 7.5% SDS-PAGE, electrotransferred, and immunoblotted with indicated Abs, as described in Materials and Methods. C, Celecoxib did not directly interact with IKK. Whole cell extracts were prepared from untreated and 0.1 nM TNF-treated H1299 cells (2 × 106/ml). Whole cell extract protein (200 μg/sample) was immunoprecipitated with Abs against IKKα and IKKβ. The immune complex was treated with the indicated concentrations of celecoxib for 30 min at 30°C, and then an immune complex kinase assay was performed, as described in Materials and Methods. Equal protein loading was assured by β-actin. D, Celecoxib inhibited TNF-induced phosphorylation of p65. H1299 cells (2 × 106/ml) were incubated with 100 μM celecoxib for 4 h and then treated with 0.1 nM TNF for different times. The cytoplasmic extracts were analyzed by Western blotting using Abs against the phosphorylated form of p65. E, Celecoxib inhibited TNF-induced nuclear translocation of p65. H1299 cells (1 × 106/ml) were either untreated or pretreated with 100 μM celecoxib for 4 h at 37°C and then treated with 0.1 nM TNF for different times. Nuclear extracts were prepared and analyzed by Western blotting using Abs against p65. Because celecoxib inhibits the phosphorylation of IκBα and p65, we tested the effect of celecoxib on TNF-induced IKK activation, which is required for TNF-induced phosphorylation of IκBα (42). As shown in Fig. 3⇑B, in immune complex kinase assays, TNF activated IKK, and the activation could be seen as early as 5 min after TNF treatment (upper panel). Celecoxib treatment completely suppressed the TNF-induced activation of IKK. TNF or celecoxib had no direct effect on the expression of either IKKα (middle panel) or IKKβ (lower panel). We also determined whether celecoxib inhibited IKK directly. We immunoprecipitated IKK from TNF-treated cells and then incubated the precipitates with different concentrations of celecoxib. Results in Fig. 3⇑C indicate that celecoxib had no direct effect on the IKK activity. TNF has been shown to induce the phosphorylation of p65, which is required for translocation of p65 to the nucleus (27). Therefore, we also tested the effect of celecoxib on TNF-induced phosphorylation of p65. As shown in Fig. 3⇑D, TNF induced the phosphorylation of p65 in a time-dependent manner, and celecoxib treatment suppressed p65 phosphorylation almost completely. We also demonstrated celecoxib blocked TNF-induced nuclear translocation of p65, using Western blot analysis (Fig. 3⇑E). TNF has been shown to activate NF-κB through activation of Akt (28). Therefore, we also tested the effect of celecoxib on TNF-induced activation of Akt. As shown in Fig. 4⇓A, TNF induced the activation of Akt in a time-dependent manner, and celecoxib treatment suppressed Akt activation almost completely. A, Celecoxib inhibited TNF-induced Akt phosphorylation. H1299 cells (2 × 106/ml) were incubated with 100 μM celecoxib for 4 h at 37°C, treated with 0.1 nM TNF for different times as indicated at 37°C, and tested for phosphorylated Akt in whole cell fractions by Western blot analysis with Abs against phosphorylated Akt. Equal protein loading was assured by Akt protein. B, Effect of celecoxib on the TNF-induced interaction between Akt and IKKα. H1299 cells (1 × 107/ml) were incubated with 1 nM TNF for indicated times, prepared whole cell extract, immunoprecipitated with anti-Akt Ab, and then performed Western blot analysis using anti-IKKα Ab. Akt has been shown to interact with IKK, the protein kinase required for NF-κB activation (28). Whether celecoxib modulates Akt interaction with IKK was investigated. For this, extracts were prepared from cells either treated with TNF or with TNF and celecoxib, immunoprecipitated using specific anti-Akt Abs, and then analyzed by Western blot using IKKα Abs. Results in Fig. 4⇑B show that TNF induced the interaction of Akt with IKK and celecoxib suppressed this interaction. Although we showed by EMSA that celecoxib blocked NF-κB activation, DNA binding alone does not always correlate with NF-κB-dependent gene transcription, suggesting that there are additional regulatory steps (43). To determine the effect of celecoxib on TNF-induced NF-κB-dependent reporter gene expression, we transiently transfected celecoxib-pretreated or untreated cells with the NF-κB-regulated SEAP reporter construct and then stimulated the cells with TNF. An almost 7-fold increase in SEAP activity over the vector control was noted after stimulation with TNF (Fig. 5⇓A). Most of the TNF-induced SEAP activity was abolished in cells transfected with dominant-negative IκBα (32, 33) along with NF-κB-regulated SEAP plasmid, indicating specificity that the expression of SEAP was induced by TNF-induced NF-κB activation. When the cells were pretreated with celecoxib, TNF-induced NF-κB-dependent SEAP expression was inhibited at a celecoxib concentration of 100 μM. Thus, celecoxib inhibited NF-κB-dependent reporter gene expression induced by TNF. A, Celecoxib inhibited TNF-induced NF-κB-dependent reporter gene (SEAP) expression. H1299 cells transfected with a plasmid containing NF-κB-responsive element linked to the SEAP gene were treated with the indicated concentrations of celecoxib. After 24 h in culture with 1 nM TNF, cell supernatants were collected and assayed for SEAP activity, as described in Materials and Methods. Results are expressed as fold activity over the activity of the vector control. Values are means ± SD (indicated as error bars) of triplicate cultures of a representative experiment of the three independent ones showing similar results. ∗, p < 0.001; ∗∗, p < 0.0005, vs values for TNF-treated control. B, Celecoxib inhibited NF-κB-dependent reporter gene expression induced by TNF, TNFR-1, TRADD, TRAF2, NIK, and IKK. H1299 cells were transfected with the indicated plasmids along with a plasmid containing NF-κB-responsive element linked to the SEAP gene and then either left untreated or treated with 100 μM celecoxib for 4 h. Cell supernatants were assayed for secreted alkaline phosphatase activity, as described in Materials and Methods. Results are expressed as fold activity over the activity of the vector control. Values are means ± SD (indicated as error bars) of triplicate cultures of a representative experiment of the three independent ones showing similar results. ∗, p < 0.005; ∗∗, p < 0.001, vs values for respective untreated controls. C, Celecoxib inhibited induction of COX-2, MMP-9, and cyclin D1 by TNF. H1299 cells (2 × 106/ml) were left untreated or incubated with 100 μM celecoxib for 4 h and then treated with 0.1 nM TNF for indicated times. Whole cell extracts were prepared, and 80 μg of the whole cell lysate was analyzed by Western blotting using Abs against COX-2, MMP-9, and cyclin D1. D, Celecoxib inhibited TNF-induced COX-2-dependent luciferase activity. H1299 cells were transiently transfected with COX-2-luciferase plasmid, and then treated with various concentrations of celecoxib for 4 h. The cells were then exposed to 1 nM TNF, as indicated. After 36 h, the cells were harvested and assayed for luciferase activity, as described in Materials and Methods. Values are means ± SD (indicated by error bars) oftriplicate cultures of a representative experiment of three independent ones showing similar results. ∗p < 0.001, ∗∗p < 0.005, ∗∗∗p < 0.0005 vs values of TNF-treated controls. E, DN-Akt inhibits TNF-induced NF-κB activation. H1299 cells were transfected in triplicate with either control vector (lane 1), or NF-κB reporter plasmid (lane 2), or DN-Akt plasmid (lane 3), or with NF-κB reporter plasmid along with TNF (1 nM) treatment (lane 4) or NF-κB reporter plasmid along with DN-Akt plasmid and TNF (1 nM) treatment (lane 5). After 36 h, cell supernatants were assayed for secreted alkaline phosphatase activity, as described in Materials and Methods. Results are expressed as fold activity over the activity of the vector control. Values are means ± SD (indicated as error bars) of triplicate cultures of a representative experiment of the three independent ones showing similar results. p < 0.005 vs values for TNF-treated control. TNF-induced NF-κB activation is mediated through sequential interaction of the TNF receptor with TNF receptor-associated death domain (TRADD), TRAF2, NF-κB-inducing kinase (NIK), and IKKβ, resulting in phosphorylation of IκBα (44, 45). 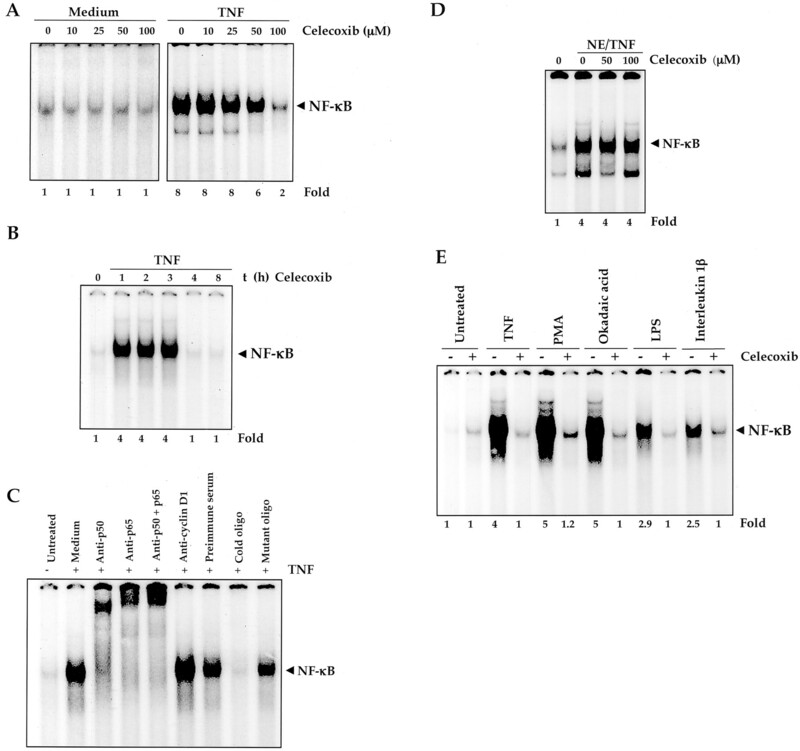 To delineate the site of action of celecoxib in the TNF-signaling pathway leading to NF-κB activation, cells were transfected with TNFR1, TRADD, TRAF2, NIK, IKKβ, and p65 plasmids, and then NF-κB-dependent SEAP expression was monitored in celecoxib-untreated and -treated cells. As shown in Fig. 5⇑B, TNFR1, TRADD, TRAF2, NIK, IKK, and p65 plasmids induced gene expression, and celecoxib suppressed reporter gene expression induced by all these plasmids, except p65. Because phophorylation of IκBα and p65 is needed for NF-κB activation (27), the results suggest that celecoxib inhibited the kinase involved in their phosphorylation. Our results indicated that TNF activates NF-κB through activation of Akt and IKK, leading to phosphorylation and degradation of IκBα, and that NF-κB is transcriptionally active. Because cyclin D1, COX-2, and MMP-9 are NF-κB-regulated genes (46, 47, 48, 49), we investigated whether suppression of TNF-induced NF-κB activation by celecoxib abrogates induction of these three genes. H1299 cells, either untreated or pretreated with celecoxib, were exposed to TNF for different times. Whole cell extracts were prepared and analyzed by Western blotting. TNF induced COX-2, cyclin D1, and MMP-9 (Fig. 5⇑C) expression in a time-dependent manner, and celecoxib abolished the TNF-induced expression of these gene products. Because down-regulation of NF-κB by celecoxib suppresses the expression of NF-κB-regulated gene products, we also examined the effect of celecoxib on TNF-induced COX-2 promoter activity. The results in Fig. 5⇑D show that TNF activated the COX-2 promoter activity and celecoxib inhibited this activation in a dose-dependent manner. Above results indicate that TNF can activate Akt, and celecoxib inhibits it. Whether TNF-induced NF-κB activation is also mediated through Akt was investigated. For this, cells were transfected with either control vector (lane 1), or NF-κB reporter plasmid (lane 2), or DN-Akt plasmid (lane 3), or with NF-κB reporter plasmid along with TNF treatment (lane 4) or NF-κB reporter plasmid along with DN-Akt plasmid and TNF treatment (lane 5). The results shown in Fig. 5⇑E indicate that TNF activated the NF-κB reporter activity and DN-Akt inhibited it. These results thus suggest that Akt is also needed for TNF-induced NF-κB activation. Whether celecoxib inhibits only TNF-induced NF-κB activation pathway or other pathways also was investigated. TNF is known to activate p38 MAPK, ERK, and JNK pathways. The effect of celecoxib on TNF-induced activation of p38 MAPK, ERK, and JNK pathway was examined. Results in Fig. 6⇓ show that celecoxib abrogated the activation of all the three pathways, thus suggesting that celecoxib also inhibits pathways other than NF-κB. Celecoxib inhibited induction of p38 MAPK, ERK, and JNK by TNF. H1299 cells (2 × 106/ml) were left untreated or incubated with 100 μM celecoxib for 4 h and then treated with 0.1 nM TNF for indicated times. Whole cell extracts were prepared, and 50 μg of the whole cell lysate was analyzed by Western blotting using Abs against phosphorylated p38 MAPK, and phosphorylated ERK. The blots were stripped and reprobed with p38 MAPK and ERK Abs to examine the effect of celecoxib on protein expression. For JNK assay, 200 μg of cell extract was immunoprecipitated with Abs against JNK. An immune complex kinase assay was then performed, as described in Materials and Methods. To examine the effect of celecoxib on the level of expression of JNK proteins, 30 μg of cytoplasmic extracts was run on 10% SDS-PAGE, electrotransferred, and immunoblotted with JNK Ab, as described in Materials and Methods. Celecoxib is known to inhibit COX-2, the enzyme responsible for catalyzing the formation of PGE2 from arachidonic acid. Whether TNF-induced NF-κB activation by celecoxib is mediated through the suppression of COX-2 was investigated. To determine this, cells were exposed to exogenous PGE2 together with celecoxib and then examined for TNF-induced NF-κB activation. The results in Fig. 7⇓ show that suppression of TNF-induced NF-κB activation by celecoxib could be reversed by PGE2. The latter alone had no effect on TNF-induced NF-κB activation. Thus, these results suggest that celecoxib inhibits NF-κB activation through the suppression of COX-2. Exogenous PGE2 reversed the inhibitory effects of celecoxib. H1299 cells (2 × 106/ml) were preincubated with celecoxib and PGE2 either alone or in combination for 4 h at 37°C and then treated with 0.1 nM TNF for 30 min. Nuclear extracts were prepared and tested for NF-κB activation, as described in Materials and Methods. The goal of this study was to investigate the effect of celecoxib on the activation of NF-κB and NF-κB-regulated gene products induced by TNF. We found that celecoxib suppressed NF-κB activation induced by various carcinogens, inflammatory agents, and tumor promoters, through inhibition of IKK activation, IκBα phosphorylation, IκBα degradation, p65 phosphorylation, and nuclear translocation. Celecoxib suppressed both inducible and constitutive NF-κB without cell type specificity. Celecoxib also suppressed the TNF-induced Akt activation and interaction of Akt with IKK. NF-κB-regulated gene products COX-2, MMP-9, and cyclin D1 expression were also suppressed by celecoxib. Besides NF-κB, celecoxib also suppressed TNF-induced JNK, p38 MAPK, and ERK activation. Our results clearly demonstrate that celecoxib can suppress NF-κB activation induced by various carcinogens and inflammatory agents. This suppression was mediated through inhibition of IKK activation. We also found that celecoxib inhibits TNF-induced activation of Akt. The suppression of TNF-induced Akt activation by celecoxib is consistent with previous reports that showed that constitutive activation of Akt in prostate cancer cells (19) and in colon cancer cells (17) is inhibited by celecoxib. Previously, it was shown by DNA binding that celecoxib inhibits IL-1-induced NF-κB activation at 1 μM and stimulates it at 50 μM (50) in rat mesangial cells. Whether the DNA binding observed was indeed NF-κB (no supershift or cold competition shown) or how NF-κB was inhibited or stimulated by celecoxib was not investigated. Our results clearly show that celecoxib did not stimulate, but rather inhibited NF-κB activation induced by a wide variety of agents including IL-1, and that this suppression occurred through inhibition of IκBα phosphorylation and degradation. However, the possibility that the effects of celecoxib may also involve the regulation of expression or degradation of some other proteins could not be ruled out, as celecoxib requires a 4-h incubation time to inhibit TNF-induced NF-κB activation. Interestingly, however, inhibition of Akt by celecoxib in human prostate cancer cells (19) or inhibition of PI3K-dependent protein kinase 1 activity by celecoxib in human colon cancer HT29 cells (17) also required exposure of cells to celecoxib for 4 h. The slower kinetics may be either due to sluggish cell permeability of celecoxib or due to involvement of other intermediates. Although celecoxib is known to inhibit the activity of COX-2, our results indicate that it can also suppress the synthesis of COX-2, which is regulated by NF-κB (48). Previous reports on the suppression of angiogenesis by celecoxib (14, 15) may also be mediated in part through inhibition of NF-κB-regulated MMP-9 synthesis (49). Cyclin D1 is overexpressed in a wide variety of tumors (for references, see51), and it is regulated by NF-κB (46, 47). The NF-κB-mediated down-regulation of cyclin D1 may explain the antiproliferative effects of celecoxib. NF-κB activation has also been implicated in chemoresistance (52). Thus, our results indicate that celecoxib behaves like other nonsteroidal anti-inflammatories such as sulindac and aspirin, both of which have been shown to suppress NF-κB activation (53, 54, 55). Celecoxib also inhibited the TNF-induced activation of p38 MAPK, ERK, and JNK, all of which are implicated in tumorigenesis. Our results are in agreement with studies in which celecoxib has been shown to inhibit angiogenesis by inhibiting ERK activity (56) and inhibit p38 MAPK and JNK activity in a mouse skin carcinogenesis model (57). Whether the concentrations of celecoxib used in this study are clinically relevant and achievable is very important. When administered orally 800 mg dose to human subjects, Davies et al. (58) have reported a serum concentration of celecoxib up to 8 μM. Several points need to be considered while comparing drug doses in vitro vs that in vivo. A similar concentration of celecoxib that was used by us has been used by others in vitro (17, 19) for suppression of PI3K-dependent protein kinase 1 and Akt. In our study, the cells were exposed to celecoxib for short-term (just few hours), but in vivo exposure occurs for long-term (days); moreover, proteins have been identified in the serum that binds to celecoxib and neutralizes its activity (18). As the true relevant celecoxib concentration in the tissue is unclear, it is difficult to correlate the celecoxib concentration used in vitro to that achievable clinically. It is possible, however, that in vitro mechanism of action of celecoxib as described in this work is different from that observed in vivo. Thus, overall, our results indicate that celecoxib can suppress NF-κB activation induced by a wide variety of agents in various cell types. The suppression of NF-κB activation by celecoxib, as described in this work, may explain its role in antitumor, chemoprevention, chemosensitivity, antiangiogenesis, antiproliferation, and induction of apoptosis. We thank Walter Pagel for a careful review of the manuscript. ↵1 This work was supported by the Clayton Foundation for Research (to B.B.A. ), a Department of Defense U.S. Army Breast Cancer Research Program grant (BC010610, to B.B.A. ), a PO1 grant (CA91844) from the National Institutes of Health on lung chemoprevention (to B.B.A. ), and a P50 Head and Neck Specialized Program of Research Excellence grant from the National Institutes of Health (to B.B.A.). B.B.A. is a Ransom Horne Distinguished Professor of Cancer Research. ↵3 Abbreviations used in this paper: COX-2, cyclooxygenase-2; IKK, IκBα kinase; MMP, matrix metalloproteinase; NIK, NF-κB-inducing kinase; SEAP, secretory alkaline phosphatase; TRADD, TNF receptor-associated death domain; TRAF, TNF receptor-associated factor. Everts, B., P. Wahrborg, T. Hedner. 2000. COX-2-specific inhibitors: the emergence of a new class of analgesic and anti-inflammatory drugs. Clin. Rheumatol. 19:331. Steinbach, G., P. M. Lynch, R. K. Phillips, M. H. Wallace, E. Hawk, G. B. Gordon, N. Wakabayashi, B. Saunders, Y. Shen, T. Fujimura, et al 2000. The effect of celecoxib, a cyclooxygenase-2 inhibitor, in familial adenomatous polyposis. N. Engl. J. Med. 342:1946. Williams, C. S., A. J. Watson, H. Sheng, R. Helou, J. Shao, R. N. DuBois. 2000. Celecoxib prevents tumor growth in vivo without toxicity to normal gut: lack of correlation between in vitro and in vivo models. Cancer Res. 60:6045. Zweifel, B. S., T. W. Davis, R. L. Ornberg, J. L. Masferrer. 2002. Direct evidence for a role of cyclooxygenase 2-derived prostaglandin E2 in human head and neck xenograft tumors. Cancer Res. 62:6706. Trifan, O. C., W. F. Durham, V. S. Salazar, J. Horton, B. D. Levine, B. S. Zweifel, T. W. Davis, J. L. Masferrer. 2002. Cyclooxygenase-2 inhibition with celecoxib enhances antitumor efficacy and reduces diarrhea side effect of CPT-11. Cancer Res. 62:5778. Kawamori, T., C. V. Rao, K. Seibert, B. S. Reddy. 1998. Chemopreventive activity of celecoxib, a specific cyclooxygenase-2 inhibitor, against colon carcinogenesis. Cancer Res. 58:409. Reddy, B. S., Y. Hirose, R. Lubet, V. Steele, G. Kelloff, S. Paulson, K. Seibert, C. V. Rao. 2000. Chemoprevention of colon cancer by specific cyclooxygenase-2 inhibitor, celecoxib, administered during different stages of carcinogenesis. Cancer Res. 60:293. Jacoby, R. F., K. Seibert, C. E. Cole, G. Kelloff, R. A. Lubet. 2000. The cyclooxygenase-2 inhibitor celecoxib is a potent preventive and therapeutic agent in the min mouse model of adenomatous polyposis. Cancer Res. 60:5040. Rao, C. V., C. Indranie, B. Simi, P. T. Manning, J. R. Connor, B. S. Reddy. 2002. Chemopreventive properties of a selective inducible nitric oxide synthase inhibitor in colon carcinogenesis, administered alone or in combination with celecoxib, a selective cyclooxygenase-2 inhibitor. Cancer Res. 62:165. Harris, R. E., G. A. Alshafie, H. Abou-Issa, K. Seibert. 2000. Chemoprevention of breast cancer in rats by celecoxib, a cyclooxygenase 2 inhibitor. Cancer Res. 60:2101. Abou-Issa, H. M., G. A. Alshafie, K. Seibert, A. T. Koki, J. L. Masferrer, R. E. Harris. 2001. Dose-response effects of the COX-2 inhibitor, celecoxib, on the chemoprevention of mammary carcinogenesis. Anticancer Res. 21:3425. Grubbs, C. J., R. A. Lubet, A. T. Koki, K. M. Leahy, J. L. Masferrer, V. E. Steele, G. J. Kelloff, D. L. Hill, K. Seibert. 2000. Celecoxib inhibits N-butyl-N-(4-hydroxybutyl)-nitrosamine-induced urinary bladder cancers in male B6D2F1 mice and female Fischer-344 rats. Cancer Res. 60:5599. Fischer, S. M., H. H. Lo, G. B. Gordon, K. Seibert, G. Kelloff, R. A. Lubet, C. J. Conti. 1999. Chemopreventive activity of celecoxib, a specific cyclooxygenase-2 inhibitor, and indomethacin against ultraviolet light-induced skin carcinogenesis. Mol. Carcinog. 25:231. Masferrer, J. L., K. M. Leahy, A. T. Koki, B. S. Zweifel, S. L. Settle, B. M. Woerner, D. A. Edwards, A. G. Flickinger, R. J. Moore, K. Seibert. 2000. Antiangiogenic and antitumor activities of cyclooxygenase-2 inhibitors. Cancer Res. 60:1306. Leahy, K. M., R. L. Ornberg, Y. Wang, B. S. Zweifel, A. T. Koki, J. L. Masferrer. 2002. Cyclooxygenase-2 inhibition by celecoxib reduces proliferation and induces apoptosis in angiogenic endothelial cells in vivo. Cancer Res. 62:625. Kisley, L. R., B. S. Barrett, L. D. Dwyer-Nield, A. K. Bauer, D. C. Thompson, A. M. Malkinson. 2002. Celecoxib reduces pulmonary inflammation but not lung tumorigenesis in mice. Carcinogenesis 23:1653. Arico, S., S. Pattingre, C. Bauvy, P. Gane, A. Barbat, P. Codogno, E. Ogier-Denis. 2002. Celecoxib induces apoptosis by inhibiting 3-phosphoinositide-dependent protein kinase-1 activity in the human colon cancer HT-29 cell line. J. Biol. Chem. 277:27613. Levitt, R. J., M. Pollak. 2002. Insulin-like growth factor-I antagonizes the antiproliferative effects of cyclooxygenase-2 inhibitors on BxPC-3 pancreatic cancer cells. Cancer Res. 62:7372. Hsu, A. L., T. T. Ching, D. S. Wang, X. Song, V. M. Rangnekar, C. S. Chen. 2000. The cyclooxygenase-2 inhibitor celecoxib induces apoptosis by blocking Akt activation in human prostate cancer cells independently of Bcl-2. J. Biol. Chem. 275:11397. Song, X., H. P. Lin, A. J. Johnson, P. H. Tseng, Y. T. Yang, S. K. Kulp, C. S. Chen. 2002. Cyclooxygenase-2, player or spectator in cyclooxygenase-2 inhibitor-induced apoptosis in prostate cancer cells. J. Natl. Cancer Inst. 94:585. Waskewich, C., R. D. Blumenthal, H. Li, R. Stein, D. M. Goldenberg, J. Burton. 2002. Celecoxib exhibits the greatest potency amongst cyclooxygenase (COX) inhibitors for growth inhibition of COX-2-negative hematopoietic and epithelial cell lines. Cancer Res. 62:2029. Grosch, S., I. Tegeder, E. Niederberger, L. Brautigam, G. Geisslinger. 2001. COX-2 independent induction of cell cycle arrest and apoptosis in colon cancer cells by the selective COX-2 inhibitor celecoxib. FASEB J. 15:2742. Johnson, A. J., A. L. Hsu, H. P. Lin, X. Song, C. S. Chen. 2002. The cyclo-oxygenase-2 inhibitor celecoxib perturbs intracellular calcium by inhibiting endoplasmic reticulum Ca2+-ATPases: a plausible link with its anti-tumor effect and cardiovascular risks. Biochem. J. 366:831. Pahl, H. L.. 1999. Activators and target genes of Rel/NF-κB transcription factors. Oncogene 18:6853. Garg, A., B. B. Aggarwal. 2002. Nuclear transcription factor-κB as a target for cancer drug development. Leukemia 16:1053. Shishodia, S., B. B. Aggarwal. 2002. Nuclear factor-κB activation: a question of life and death. J. Biochem. Mol. Biol. 35:28. Ghosh, S., M. Karin. 2002. Missing pieces in the NF-κB puzzle. Cell 109:S81. Ozes, O. N., L. D. Mayo, J. A. Gustin, S. R. Pfeffer, L. M. Pfeffer, D. B. Donner. 1999. NF-κB activation by tumor necrosis factor requires the Akt serine-threonine kinase. Nature 401:82. Romashkova, J. A., S. S. Makarov. 1999. NF-κB is a target of AKT in anti-apoptotic PDGF signalling. Nature 401:86. Jones, R. G., M. Parsons, M. Bonnard, V. S. Chan, W. C. Yeh, J. R. Woodgett, P. S. Ohashi. 2000. Protein kinase B regulates T lymphocyte survival, nuclear factor κB activation, and Bcl-xL levels in vivo. J. Exp. Med. 191:1721. Madrid, L. V., C. Y. Wang, D. C. Guttridge, A. J. Schottelius, A. S. Baldwin, Jr, M. W. Mayo. 2000. Akt suppresses apoptosis by stimulating the transactivation potential of the RelA/p65 subunit of NF-κB. Mol. Cell. Biol. 20:1626. Chaturvedi, M. M., A. Mukhopadhyay, B. B. Aggarwal. 2000. Assay for redox-sensitive transcription factor. Methods Enzymol. 319:585. Majumdar, S., B. B. Aggarwal. 2001. Methotrexate suppresses NF-κB activation through inhibition of IκBα phosphorylation and degradation. J. Immunol. 167:2911. Manna, S. K., A. Mukhopadhyay, B. B. Aggarwal. 2000. IFN-α suppresses activation of nuclear transcription factors NF-κB and activator protein 1 and potentiates TNF-induced apoptosis. J. Immunol. 165:4927. Manna, S. K., N. K. Sah, R. A. Newman, A. Cisneros, B. B. Aggarwal. 2000. Oleandrin suppresses activation of nuclear transcription factor-κB, activator protein-1, and c-Jun NH2-terminal kinase. Cancer Res. 60:3838. Finco, T. S., A. A. Beg, A. S. Baldwin, Jr. 1994. Inducible phosphorylation of IκBα is not sufficient for its dissociation from NF-κB and is inhibited by protease inhibitors. Proc. Natl. Acad. Sci. USA 91:11884. Mahon, T. M., L. A. O’Neill. 1995. Studies into the effect of the tyrosine kinase inhibitor herbimycin A on NF-κB activation in T lymphocytes: evidence for covalent modification of the p50 subunit. J. Biol. Chem. 270:28557. Natarajan, K., S. Singh, T. R. Burke, Jr, D. Grunberger, B. B. Aggarwal. 1996. Caffeic acid phenethyl ester is a potent and specific inhibitor of activation of nuclear transcription factor NF-κB. Proc. Natl. Acad. Sci. USA 93:9090. Sizemore, N., N. Lerner, N. Dombrowski, H. Sakurai, G. R. Stark. 2002. Distinct roles of the IκB kinase α and β subunits in liberating nuclear factor κB (NF-κB) from IκB and in phosphorylating the p65 subunit of NF-κB. J. Biol. Chem. 277:3863. Nasuhara, Y., I. M. Adcock, M. Catley, P. J. Barnes, R. Newton. 1999. Differential IκB kinase activation and IκBα degradation by interleukin-1β and tumor necrosis factor-α in human U937 monocytic cells: evidence for additional regulatory steps in κB-dependent transcription. J. Biol. Chem. 274:19965. Hsu, H., H. B. Shu, M. G. Pan, D. V. Goeddel. 1996. TRADD-TRAF2 and TRADD-FADD interactions define two distinct TNF receptor 1 signal transduction pathways. Cell 84:299. Simeonidis, S., D. Stauber, G. Chen, W. A. Hendrickson, D. Thanos. 1999. Mechanisms by which IκB proteins control NF-κB activity. Proc. Natl. Acad. Sci. USA 96:49. Yamamoto, K., T. Arakawa, N. Ueda, S. Yamamoto. 1995. Transcriptional roles of nuclear factor κB and nuclear factor-interleukin-6 in the tumor necrosis factor α-dependent induction of cyclooxygenase-2 in MC3T3–E1 cells. J. Biol. Chem. 270:31315. Esteve, P. O., E. Chicoine, O. Robledo, F. Aoudjit, A. Descoteaux, E. F. Potworowski, Y. St-Pierre. 2002. Protein kinase C-ζ regulates transcription of the matrix metalloproteinase-9 gene induced by IL-1 and TNF-α in glioma cells via NF-κB. J. Biol. Chem. 277:35150. Niederberger, E., I. Tegeder, G. Vetter, A. Schmidtko, H. Schmidt, C. Euchenhofer, L. Brautigam, S. Grosch, G. Geisslinger. 2001. Celecoxib loses its anti-inflammatory efficacy at high doses through activation of NF-κB. FASEB J. 15:1622. Mukhopadhyay, A., S. Banerjee, L. J. Stafford, C. Xia, M. Liu, B. B. Aggarwal. 2002. Curcumin-induced suppression of cell proliferation correlates with down-regulation of cyclin D1 expression and CDK4-mediated retinoblastoma protein phosphorylation. Oncogene 21:8852. Wang, C. Y., M. W. Mayo, A. S. Baldwin, Jr. 1996. TNF- and cancer therapy-induced apoptosis: potentiation by inhibition of NF-κB. Science 274:784. Kopp, E., S. Ghosh. 1994. Inhibition of NF-κB by sodium salicylate and aspirin. Science 265:956. Yin, M. J., Y. Yamamoto, R. B. Gaynor. 1998. The anti-inflammatory agents aspirin and salicylate inhibit the activity of IκB kinase-β. Nature 396:77. Yamamoto, Y., M. J. Yin, K. M. Lin, R. B. Gaynor. 1999. Sulindac inhibits activation of the NF-κB pathway. J. Biol. Chem. 274:27307. Jones, M. K., H. Wang, B. M. Peskar, E. Levin, R. M. Itani, I. J. Sarfeh, A. S. Tarnawski. 1999. Inhibition of angiogenesis by nonsteroidal anti-inflammatory drugs: insight into mechanisms and implications for cancer growth and ulcer healing. Nat. Med. 5:1418. Chun, K. S., S. H. Kim, Y. S. Song, Y. J. Surh. 2004. Celecoxib inhibits phorbol ester-induced expression of COX-2 and activation of AP-1 and p38 MAP kinase in mouse skin. Carcinogenesis 25:713. Davies, N. M., A. J. McLachlan, R. O. Day, K. M. Williams. 2000. Clinical pharmacokinetics and pharmacodynamics of celecoxib: a selective cyclo-oxygenase-2 inhibitor. Clin. Pharmacokinet. 38:225.